In the world of conspiracy, assassination, and adventure; no game stands taller than Assassin’s Creed Identity. We know that this game is what you were waiting for, so we will get right into it. Assassin’s Creed Identity [Free] is an upcoming action-adventure stealth game for both, IOS and Android. It is the first Assassin’s Creed title to be identical to the Assassin’s Creed universe, in terms of theme, gameplay, and overall experience. The 3D anticipated game is being developed by Ubisoft and they told us a lot about this game but one thing we could not get is a release date. The reason for this is that they are working on it really hard to make it live up to the name it holds. So they have no release date planned and we definitely support that. After all, we don’t want a broken game, right? The game’s theme will be based on the memories of past and present which can be uncovered by reading the Codex. All this will be taking place in the Coliseum, Florence & other familiar locations in Renaissance Italy. The world map will present familiar places to those who have already played this title on console. Through your venture into this strange world, you collect items that help you understand the bigger story. One thing that really disappointed us is that it lacks an immersive story and you basically play through each mission not really having a deep plot to motivate you. Nevertheless, it stays true to the traditional AC style that we have come to know & love – this means you can sneak, you can stab, and you can definitely climb. And really, it is the closest AC experience we have at the moment, so we can’t really complain much. Furthermore, there are many new heroes presented and you can choose from 3 unique classes: The Berserker, The Shadowblade, & The Trickster. You can customize your characters in terms of outfits and color variations as well. The game is currently Soft-Launched in New Zealand and Australia only. This is justified by the developers as a way to get feedback from the gamers there and improve it before the official release. We tested the game and it had its problems but we cannot criticize it as it’s not officially released but going through a testing process. The game is free and has in-app purchases but we have yet to see the monetary system in the final version. The game will run on iPad Air & iPhone 5s better than older devices – meaning on these powerful devices you will see more crowded streets and better detailed graphics. When we asked about an online mode, they told us that it will have a competitive feature but they are still working on it. What we are expecting is a competitive leaderboard system without any PvP modes. In addition, we asked them whether it is possible to free-roam the city without any restrictions and they replied that you can free-roam during the short missions generated and there is no open free-roaming mode. This is not necessarily horrible, because you can still roam the open world game during your missions but it definitely would have been better to be able to free-roam without missions, some which are time limited. Finally, we are excited to see the official version for this game and we believe it will be released very soon. The game will allow you to fight with swords, assassinate with knives, use social stealth to hide with the crowd, and cower under haystacks if you are about to get caught. All the elements that make up an Assassin’s Creed game will be incorporated into this new game to bring about a genuine AC experience. Ubisoft has rendered the graphics with custom-made HD textures, shaders, and models based on the Assassin’s Creed console titles. 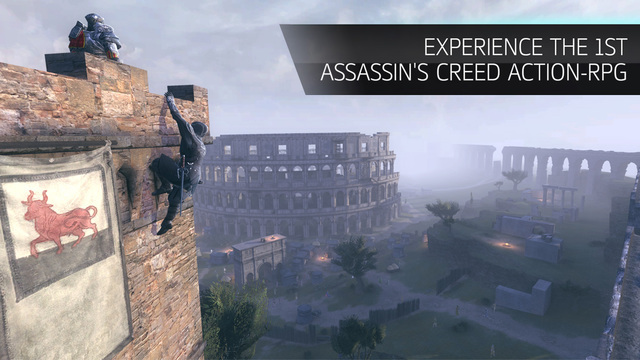 Once released worldwide, it will be the only genuine Assassin’s Creed experience on mobile yet. Stay tuned with our website for immediate update on this game. Thanks to TouchGameplay, you can check the beta gameplay for this game below. Woww!! Can’t believe it’s finally coming on mobile! Awesome! The game is not officially out yet. But when it is released worldwide, it will definitely work on iPhone 5C and should work on iOS 7. We understand your frustration and we think its taking longer than expected. We previously believed based on different sources that it will be released this year, but Ubisoft might have changed the release date for an early 2016 release. The game has been too long in soft launch and the only explanation is that they are trying to change a lot of its elements due to the feedback they are getting. And with big companies like Ubisoft, they don’t risk releasing a broken game even if that means they have to change their release dates or prolong the soft launch. We promise to inform you on our website once its available worldwide. Until then, we wish you a happy new year. It will not be the first assassins creed title on the App Store, because they have already released assassins creed pirates.